The dirty word that politicians are scared to utter is creeping into the conversation. It is usually the one word that no one will say and the one problem that no one will address. Between politicians telling us how great they are and how "Its working" we keep averting our eyes to make sure that we see what we want to see and not what is right in front of us. What is the word and issue that can not be named? Starts with a P and ends with a Y? POVERTY! The New York Times published an editorial today pointing out that both The Donald and Ms Clinton are not addressing poverty(emphasis mine). Poverty in the United States is deeper than in all other wealthy nations. Yet neither Hillary Clinton nor Donald Trump has a specific anti-poverty agenda. For example, the largest income gains in 2015 were among Americans at the bottom of the income ladder. Those gains reflect job growth, which has been supported by the Federal Reserve’s low interest-rate policy; the Fed should stay the course until the job market has returned to full health. The income gains also reflect minimum-wage increases in many states and cities, which have laid the foundation for the federal government to follow suit. The data also illustrate how much worse conditions would be without existing federal programs. Using the “supplemental” measure of poverty that is more nuanced than the official measure, the poverty rate in 2015 was 14.3 percent. Without Social Security, it would have been 22.6 percent, with nearly 27 million more people in poverty. Without the earned-income tax credit and low-income provisions on the child tax credit, the rate would have been 17.2 percent, adding 9.2 million people. Without food stamps, the rate would have been 15.7 percent, adding 4.6 million people. The statistics give the candidates all the evidence they need to make the case to voters that anti-poverty policies work. Under President Obama, life for those at the bottom rung of the American Dream ladder are getting slightly better. Government anti poverty so called entitlement programs are helping but not solving the problem. In our own back yard, in today's Wisconsin State Journal we learn that a whopping 41% of people in Dane County are not making ends meet. In the shadow of Dane County’s booming technology sector and low unemployment rate, more than two out of every five households don’t make enough money to meet basic living expenses, a new study has found. A report released Wednesday by the United Way of Wisconsin found that 41 percent or 86,855 of 211,842 Dane County households are unable to make ends meet or cover basic living expenses, including housing, child care, food, transportation and health care. This nearly matches the overall state number of 42 percent or 960,131 of 2.3 million households detailed in the United Way ALICE (Asset Limited, Income Constrained, Employed) Study. The report suggests the cost of basic annual household expenses in Wisconsin is more than most jobs can support. A typical household survival budget — covering basic expenses without regard for savings — for a family of four is estimated at $54,804 in the state. The state’s median household income is $52,622. In Dane County, the survival budget for a family of four is $69,204 and $28,608 for a single adult. The report found that 65 percent of all jobs in Wisconsin pay less than $20 an hour — so less than about $40,000 annually if working full time. Think about that! A majority of working people in Wisconsin are making less than $40,000 annually. This is in a state that at one time, with the help of Federal highways, the Mississippi river, Great Lakes and strong public schools was a manufacturing hub. This study took six months to complete and we know from reading the news that it is already out of date and the number of good paying jobs in Wisconsin is rapidly shrinking. In February of this year, researchers at UW-Madison released a report telling us that poverty in Wisconsin(unlike most of the rest of the country) was at its highest level in 30 years! Poverty in Wisconsin hit its highest level in 30 years during the five-year period ending in 2014, even as the nation's economy was recovering from the Great Recession, according to a trend analysis of U.S. census data just released by University of Wisconsin-Madison researchers. The number of Wisconsin residents living in poverty averaged 13% across that post-recession time frame — the highest since 1984, according to the analysis by UW-Madison's Applied Population Laboratory. In 1984, the poverty rate peaked at 15.5% as the nation was recovering from a double-dip recession. 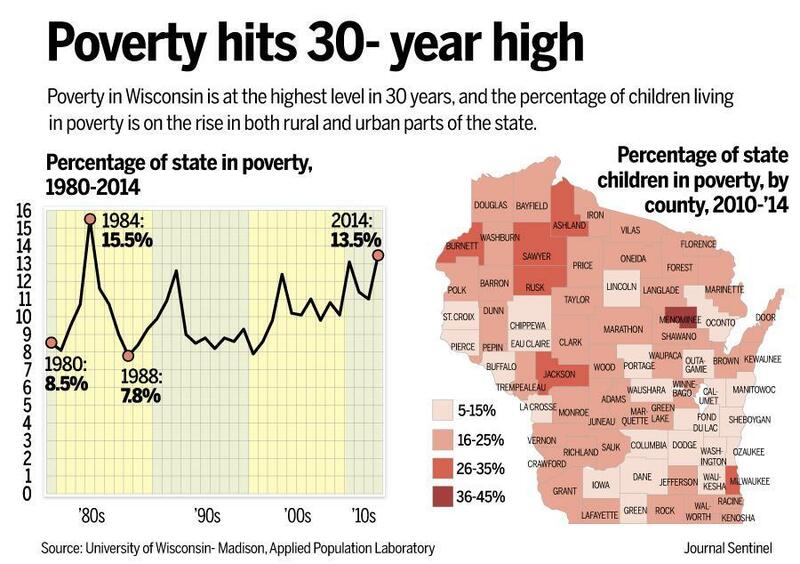 Using the five-year measure, poverty went up in both urban and rural parts of Wisconsin. It went up at every level of educational achievement, and across the employment spectrum. Perhaps most significant, the poverty gap between blacks and whites grew here as the average gap was flat across the nation. The state's child poverty rate also went up significantly, fueling concerns about the future for many of the state's youngest residents. "There is some good evidence that living in poverty and experiencing issues like food and housing insecurity can cause changes in the brain that can lead to behavioral issues and low performance in school, as well as chronic disease later in life," said Malia Jones, an assistant scientist and social epidemiologist at UW-Madison's Applied Population Laboratory. It's no coincidence that two-thirds of students who cannot read above a fourth-grade level end up either in prison or on welfare, several literacy studies have shown. What did our Governor do with that news? He decided to take his record of "accomplishment" on the road and run for President" to do for the United States what he did for Wisconsin" and drink alot of beer(provided by Wisconsin taxpayers)! While I have criticized Democrats(especially Mary Burke) for not addressing poverty in the elections, how do our friends on the right address this important issue? Poor households routinely report spending $2.40 for every $1 of income the Census says they have. (meaning they live deep in debt). Eighty-five percent of poor households have air conditioning. (You can get a window air conditioner for under $100). Half have a personal computer; 43 percent have internet access. (in 2016, half of the people in America do not have a computer and over half have no access to the internet). The average poor American lives in a house or apartment that is in good repair and has more living space than the average non poor person in France, Germany, or England. Why are these people complaining they have a front porch!